Visitors of Toool are being treated well lately. First there was the article on Master’s new Axis padlock by Michael Huebler, and now there is a new article by Han Fey. ASSA’s TWIN sidebar system makes it very difficult to pick or otherwise manipulate the lock. Combined with it’s extreme tolerances, the lock it is one of the higher quality locks on the market. And one of my all time favorites. As always, Han covers the lock deeply, answering many questions. Questions you did not even knew you had …. I hope you enjoy assa-twin-part1.pdf (2 MB) … I know I did! And Han does have some questions too … who knows more about a seven pin version of the lock? This entry was posted on Wednesday, April 9th, 2008 at 19:06 and is filed under Uncategorized. You can follow any responses to this entry through the RSS 2.0 feed. You can leave a response, or trackback from your own site. Maybe it’s just me, but the link to the article doesn’t work from here. Get rid of the last dash. Barry will get around to fixing it. And there you go, that worked. Thanks. It is TOOOL night over there currently, so later tonight he will probably get around to updating it. This is a very nice article, yes or no?! From own investigation 😉 I now know how many hours go into this type of work, and it’s really a great treat to get a share of this in-depth knowledge – thank you very much, Han! Amazing article as always. Makes me happy to have a V-10 (albeit American) on my front door that much more. By the way, TOOOL is always looking for pictures of sidebar profiles for those who own ASSA Twins. These are just some of my favorites. If Han would like any samples, feel free to contact me. A very good article. Brilliantly done and exactly what we have come to expect from Han. Someone please be sure to thank him. In the meantime, I am going to re-read this article while we patiently wait for the next part to come out. 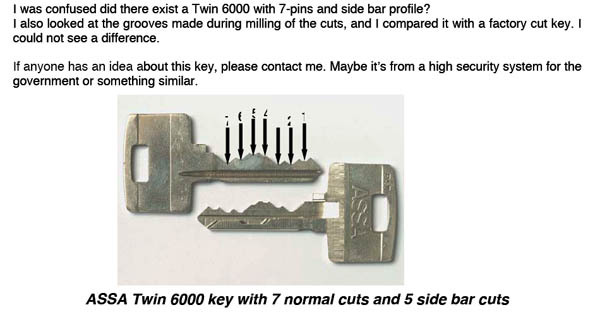 Is there any way Han could post dimensions of his 7-pin Twin 6000 key? Also, either Han blurred out the bottom of the bow, or somebody took great pains to obliterate the code in the bottom right corner. My guess would be detention, or maybe hospital use. Maybe Han can decode the sidebar? Profile is 851, so it has un undercut. All the locks or keys in my articles I did not modify. I photograph the locks, keys and pins the way they are. I did not file away anything from the bow. the assa twin key as in pic is used in prisons, not as a security key but as a inmate held key for the chubb 7 lever cell lock in 90 of uk jails, hmps give a key to each inmate for ther cell, so after the main lock has been unlocked the cell can be secured by the inmate. Well there you go. Thanks chris c!